Adherents are a subvariant of Acolyte that serves as dedicated Hive snipers which engage adversaries at an extended range firing powerful charged shots using their signature weapon: the Soulfire Rifle. 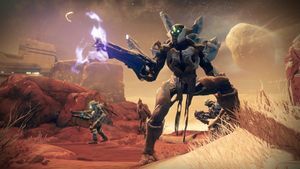 The Adherent's role and abilities in battle is similar, if not the same, as the Red Legion Psion as well as the Vex Hobgoblin and the Fallen Vandal. Adherents are noticeably rarer than other Hive units and the snipers of other factions, generally only appearing in small numbers on specific missions and are rarely seen in the open world. The Adherent is the first Hive soldier that functions as a sniper. Besides the Cabal, before the Red Legion's appearance, all other factions had snipers.